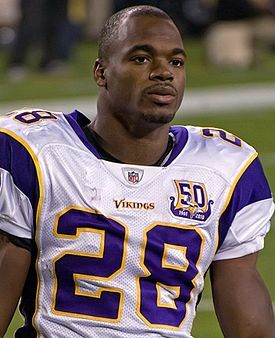 Last year at this time, Minnesota Vikings running back Adrian Peterson was a +1200 long shot to win the NFL rushing title for the 2012-2013 season. After he came back from ACL & MCL surgery to repair the damage done to his knee in the 2011 season, oddsmakers had little faith that Peterson would even be a contender for this year’s award. What finally happened there… we are all familiar with. Adrian Peterson not only won the NFL’s rushing title last year… he damned near broke the long standing mark set by Eric Dickerson of 3,006 total yards… missed it by just 9 yards and probably could have taken care of that with little more consideration from his coaching staff. As it turned out, Peterson received the league’s Most Valuable Player award also last year which only added to the soup when Las Vegas handicappers set out to post the odds on this year’s NFL rushing award. So now the boys in Vegas have taken notice and currently have Adrian Peterson listed as the favorite at +350. Despite his previous injuries, he has shown us that he has plenty of tread left on the tires and has publicly stated that his goal is to break Dickerson’s record this year… personally, I wouldn’t bet against him. In fact, the odds are so turned in favor of Peterson that certain values open up behind him on the NFL prop board. Check out these three guys. Alfred Morris of the Washington Redskins had a terrific rookie season in the nation’s capital. He exploded through the opponent’s line with such force and speed that Las Vegas oddsmakers are making him the favorite after Peterson at +1000. With RGIII being careful with that expensive knee of his, Morris should get many more opportunities to run the ball this year. Chris Johnson of the Tennessee Titans could also be in the chase for the rushing title. Known as ‘CJ2K’, Johnson rushed for 2,000 yards in the 2010 season but could only manage 1,213 last year due to an extremely slow start. Early indications are that Johnson has a good shot at the title. He opens at +1200. C.J. Spiller of the Buffalo Bills finished 8th in the league last year while carrying the ball only 207 time with the Bills dubious offense… including a passing attack ranked 29th in the league. Spiller is slated to be the Bills number one running back this year and the handicappers have him opening at +2000 to win the rushing title.